Memories to Cherish: What Happened?! I see the beautiful pictures of you, capturing all your spirit. I look at them and cry to myself... "what on earth happened here?" Why are you not with us anymore? It hurts.... I miss you so much! It just doesn't seem fair! Your life was cut short, leaving all your loved ones in despair. YOU had so much love and life and sincerity to all man kind! I could sit here and blame this and blame that, but it would do no good. If anything, I just want to clarify how and why so maybe we can save some loved ones from this pain. It's just so unneccessary. My heart is aching and my eyes are full of tears. I know, I know... you are with me everywhere! I just miss you physically okay! Everything about you! Your voice, your smile, your words of admiration and love, even your fears. I loved working through it all with you. You were my buddy, my best friend and my blood! I know in the end, life wasn't fair to you (Judge Walker & Attorney Makin) - may they be punished as you were! Harsh & Unfair!! Well, It is what it is! I accept. What choice do i have? I love you and miss you. That's it! I miss her, too. I'm so sorry you were sad today. Please call me. 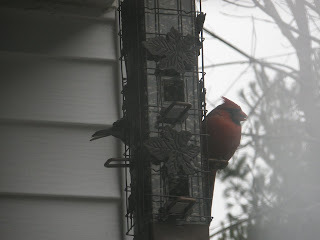 Love the pic of the cardinal- is it from your balcony? Do birds sleep at night?